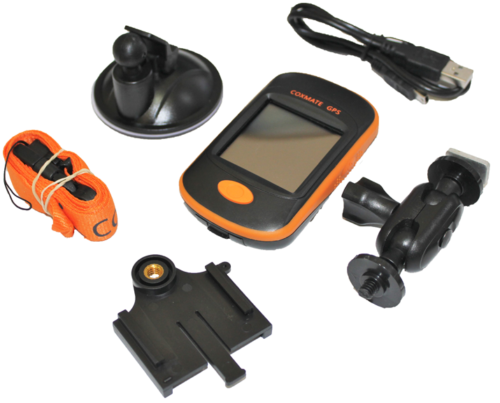 The Coxmate GPS unit is a high quality waterproof sports computer. It has been customised for rowing and other watersports such as kayaking, canoeing, dragon boating, surf skiing, stand up paddleboarding and all surf live saving disciplines. It brings a wealth of features at a very affordable price. The Hi Bright display with touchscreen makes set up and operation simple. It is supplied with a mounting kit which provides 3 mounting options:Suction mount, stretcher adjustment rail mount or standard ‘T’ mount – as used with NK® Speedcoach. The display is configurable and there are 12 variables to select from. There are two variations of the unit with one providing heart rate – optional chest strap required. The unit has a rechargeable lithium battery and is equipped with a USB port – protected with waterproof door. The USB port provides a means of downloading data to a PC and charging unit. A PC software package, including Coxmate PC Analysis Software and a route planning and recording package are included (a 12 month license is included- thereafter a nominal annual fee will be charged). This route planning also includes a navigation assist function – see where you are In relation to your programmed route. The unit has 3.5GBytes of data storage – over 100,000 strokes. The unit has Workout function – up to 24 workouts with up to 99 intervals each can be programmed. In addition there is a Pace Boat function – set a speed for a virtual boat and race against it.